On November 3rd Rethink Robotics announced the release of Intera 3.1, building on the already successful Intera 3 software by implementing the new Robot Positioning System featuring Landmarks™. The Robot Positioning System allows users to quickly re-deploy Baxter using the new Landmarks™ feature meaning that downtime and retraining of the robot is kept to an absolute minimum. This groundbreaking technology allows the Baxter collaborative robot to adapt to ever changing requirements in its real-world environment, such as re-deployment across tasks, movement of fixtures or simply a table being bumped out of its original position. Intera 3.1 now makes Baxter even easier to train and manage within your existing factory dynamics. By using environmental markers, called Landmarks™, alongside the existing embedded vision system on Baxter, the robot can adjust more readily to an ever changing work environment. By using Landmarks™ Baxter is now able to see where it is, and understand what task is being expected based on the Robot Positioning System technology. This makes is much easier for manufacturers to deploy Baxter across a range of applications without the need for complex re-programming like with a traditional industrial robot. 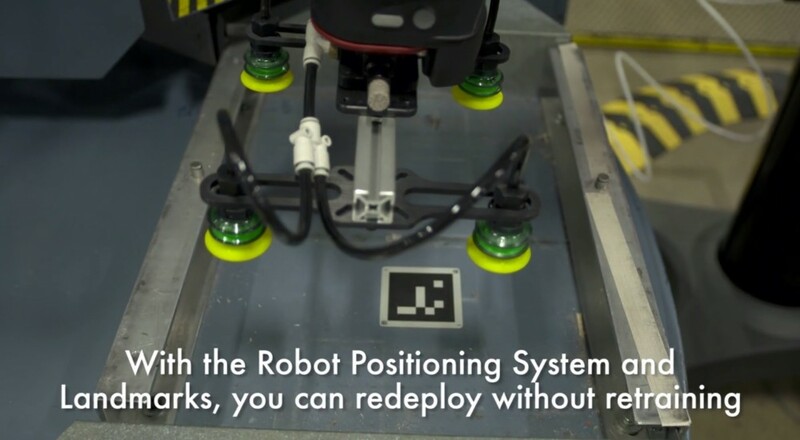 By working closely with adopters of the Baxter Manufacturing Robot, Rethink Robotics created the Robot Positioning System as part of the Intera 3.1 software release to adapt to users’ needs. By listening to the end user, and working with them to create a practical solution, the Baxter robot platform will continue to evolve into the future, maximising return on investments and creating increasingly efficient workforces, further reducing the need for offshoring. Users can now define Baxter’s environment with up to 20 Landmarks, saving time, manpower and resources when it comes to switching the applications Baxter is working on. The Robot Positioning System enables Baxter to adapt quickly to workstation changes of up to +/-50mm horizontally and within +/-10 degrees of rotation, by marking the new Landmark locations and accounting for any accidental movement or shifts in the workspace. The result is an automation solution that can readily adapt to common variations in its environment – saving considerable time and helping to keep production lines up and running. Intera 3.1 updates will be provided by Active8 Robots, Rethink Robotics’ official partner in the UK and Europe for the Baxter Robot, for more information Contact Us.